Well clearly it's not actually the 4th day of our trip, but each day was so packed and perfect and wonderful that we fell asleep by 8:30 every night with no time for blogging. Except for all the time I spent drinking margaritas and the pool and reading/watching James work out, but I was doing important work then. But even a week out from the events I'm writing about it feels like each day is still worthy of their own posts, so we're going to go through them all retroactively. In the present (our "real life" as Cora calls it), we got home Friday night about 7:00 p.m. (after waking up at 2:55 a.m.), unpacked everything, ate cereal for dinner, and had the kids in bed by 8. We decorated the house for Christmas on Saturday (my new favorite thing is being gone for Thanksgiving and then coming home to jump into the sparkly Christmas holidays), shopped and cooked and settled, and then my parents came to stay the night on their drive home from Colorado where they had celebrated Thanksgiving with the rest of my family. Sunday was a big breakfast, big family walk (including Papa and Gigi), teaching my first barre class in what felt like years (ouch), and putting up the Christmas lights and Christmas tree. It was a great weekend. I made two delicious, healthy, hearty home-cooked dinners (this vegan winter lentil stew and then this chicken wild rice casserole) that were perfect after 8 days of travel. It's so lovely to be home and I'm so ready for the holidays. But I was not ready to leave Costa Rica, so let's go back. 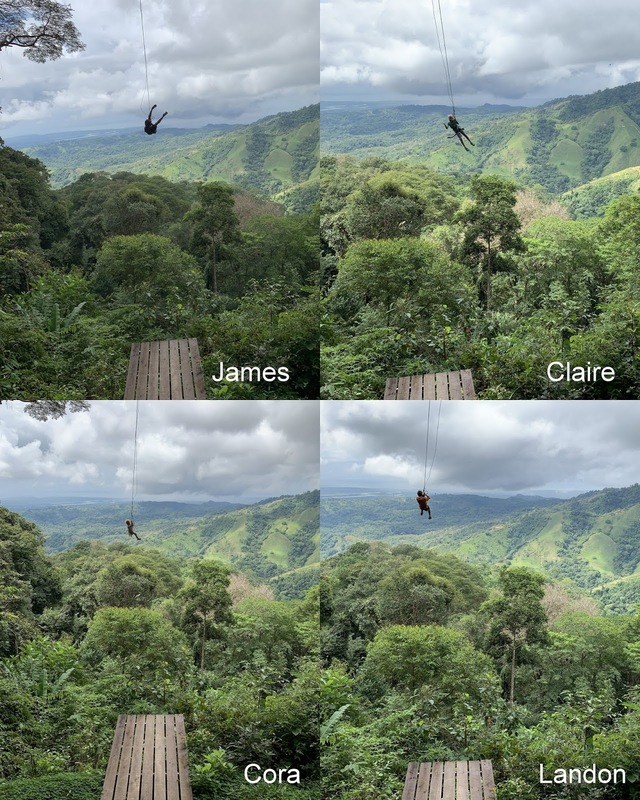 On Day 4 we woke up bright and early with the howler monkeys to get ready and head to the Osa Peninsula Rainforest for our Jungle Canopy Zip Line Tour! The kids were so excited about this one and after exploring the Pacific, going on a hike, and jumping in a spectacularly beautiful waterfall, James and I were excited to see yet another side of this beautiful country. We drove about 40 minutes south to the Osa peninsula to the tour we'd booked and then, after assuring the guides that we had a 4x4 car, we headed up a very steep mountain, high into the rainforest, in our trusty Hyundai Tucson, following behind a pickup truck with open bench seats for those who didn't want to drive. It was at least 15 minutes of bumpy roads and direct sun so I'm glad we could do it in our own car. We joined the group of about 18 to get geared up and instructed on how to work our brake gloves and harness. It all seemed pretty straight forward and then 20 seconds later you're clipped on to a line and told to pull your feet up and bam, you're off, wondering if maybe you needed more instructions. Cora had to ride with someone who knew what they were doing the first time. Just before we got up on the platform she decided mayyyybe she didn't want to do this after all, but we just kept prodding her along until she was clipped to a guide and then whoosh. I'd gone first to meet her on the other end so I was a little nervous she wouldn't like it, but I needn't have worried about my roller coaster girl- I could hear her squealing in joy and her grin as she and her expert guide swooped onto the platform was from ear to ear. Claire also rode with a guide on the first line just to get her comfortable and then she confidently handled her own zip lines from then on out. Landon flew solo the whole time, and James- only 15 pounds away from the upper weight limit- literally FLEW. Cora hooked to me for the next 8 lines and like doing anything with her in Disney, she was pure joy as a partner. "Faster faster!" she yelled, laughing and squealing with glee. We loved it. In addition to the 9 different zip lines way high up in the canopy, there were two repelling stations where you were repelled down to the jungle floor to move to another tree. Cora got to do those on her own and liked that VERY MUCH. The guides loved her- her tutu and high levels of enthusiasm and dare-deviltry made her something of a mascot. There were also two hanging bridges that were way more precarious and swingy than I envisioned. You're clipped on to a line so you're totally safe, it's just kind of crazy to walk across an actual hanging bridge high up in the trees. But the very best part was at the end. We walked to a little shelter for fresh fruit and water (the fruit in Costa Rica was AMAZING) and then you could get hooked to this rope and jump and FLY. I went first and it was amazing. It was also 300 feet above the ground. We all did it. Cora looks like a tiny little sack of potatoes flying out there and she LOVED IT. Everyone was very impressed with our adventurous kiddos. 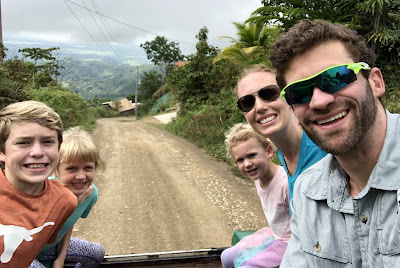 After we'd all been Tarzan, we got a ride back to our car on the back of the pickup truck, which was the kids second favorite part of the tour. We drove back down the mountain in manual first gear while James remarked that these declines were steeper than anything we'd ever driven in Colorado. Lulled by the insane bouncing of our entire car, both girls fell asleep immediately. We started to look for a place for lunch, but quickly discovered many restaurants on the Osa Peninsula (and elsewhere) are closed on Mondays. We saw a sign for Playa Ventanas, which looked beautiful in the picture I saw online and pulled in. We paid a small fee to park and hoped to find lunch, but settled for some ceviche and Costa Rican cheeto puffs from a small vendor. Playa Ventanas has caves you can explore in low tide, and the kids set out with James to do just that, but then it started to rain and the waves kicked up, so we only lasted about a half hour. Though Landon and James did manage to scale a cliff over the ocean in that time. We set out again for lunch, when I discovered a little Soda in Uvita called Soda Ranchito Dona Maria. It was 10 miles away. We were starving and we were promised authentic, local food, and that is precisely what we got. A tiny restaurant, FABULOUS food, a cook in a kitchen the size of our dinner table, one waiter (the cook's son; who left at one point to pick up his sister from school), and a few outdoor tables. It was the best meal of our trip until the very last one. The kids ordered pancakes and eggs with rice and beans, James and I ordered casado (means "married," a traditional dish with rice, beans, some kind of protein, noodles, potatoes, and a green salad- then you just sort of eat it all together and it's delicious), and we shared a bunch of other things from the appetizer section. It was all great. At one point James asked for salsa. After trying one from a bottle they brought he asked if they had a hotter one. They pulled a little Tupperware container out of their refrigerator and BAM. Challenge offered and challenge accepted. He sweated and grinned the rest of lunch. We finished eating around 2 p.m., paid our bill, and considered heading back home when I remembered there was a waterfall in Uvita. Google told me it was just 2 km up the dirt road from our little restaurant! Always prepared for a new adventure, I'd packed a bag with swimsuits and towels in the car before we left that morning, so off we went in search of "Catarata Uvita," a waterfall you could allegedly slide down! We parked, did a quick car-change into our suits, and followed a little sign to the falls. We came upon a restaurant where we paid our entry fee to the bartender ($2/person USD) and then followed the verbal directions to "walk down." Like literally everything we saw in Costa Rica, it was absurdly ridiculously beautiful. Like something out of a fairy tale. The water was freezing, but in we went. The waterfall was roaring over giant pointy boulders and I was very much doubting the "you can slide down it" aspect of the waterfall, when two locals started scaling the rock wall near the falls and whoosh, down they came. Always up to maximize any vacation adventure, Landon and James started climbing. James went first, survived, and threw Landon a thumb's up from the pool below. Whoosh, down went Landon. He flew down the current, sticking the landing to the cheers on onlookers, none of whom were setting foot in the water. I swam over with the girls. Cora was not allowed to climb up to do the waterfall and she was PISSED. We had to keep pulling her off the rocks she was attempting to climb and eventually James just towed her back to the shallow area. Claire and I headed up. The water was moving so fast and the rocks looked so very pointy, but determined not to let the men show us up, Claire and I took off. Her first, me next, and wow. It moves very fast. I somehow got sucked under the waterfall at the bottom, losing my hairband and the correct placement of my bikini underneath my rashguard, but it was quite a rush. We swam around and waterfalled a few more times (even me; bikini in place this time). Cora forgave us for not allowing her to risk her life on a steep rock climb and way too strong of a water current and went off to explore with James. A little further downstream we found a smaller waterfall with a calm lagoon that Cora got to jump into. As always, the pictures just can't convey the overwhelming beauty of it all. We spent $10 and over 2 hours at Catarata Uvita and it was such a fun bonus afternoon adventure. By now it was getting close to 4. We had a 30 minute drive home, the kids still wanted to swim in our pool, and the sun sets around 5. We headed out, stopped for gelato in Uvita to refuel, went in their super market that was much larger than ours in Dominical to buy pasta and jarred sauce because anything more required too much thought, and drove home. The kids swam. James worked out. I considered uploading pictures, but made a margarita and read my new book instead. It was lovely. The kids were in bed and asleep by 7:30 and even James and I had lights out by 8:15. The sun rises and sets so early in Dominical that even though we were still in the central time zone, it was like we hadn't adjusted to a time change. But it worked out well- the activities start early, so our senior citizen schedule kept us well rested and cheerful when the sun was high and the howler monkeys loud by 5 a.m. While I loved every activity we did (and the kids definitely voted the zip line tour as their #1), I think the waterfalls are what I'll reminder the most vividly. They were just so impossibly beautiful... it was so hard to believe we were allowed to hike down and jump in them. Truly unforgettable and so much more than I expected this highly anticipated vacation to be! I'm days behind in my blogging. Our schedule each day has been perfectly full: big activities in the mornings, with lazy afternoons discovering new local restaurants and even lazier evenings spent by the pool. The internet is super slow, I started a new book series I downloaded before leaving Texas, and the sun sets so early (and rises so early) that going to bed at 8:10 p.m. the last two nights has seemed entirely reasonable. In short, it's been perfect and we are all so in love with this beautiful place. But writing about our vacations is one of my joys of taking vacation and we really must discuss our first full day on the beautiful central Pacific coast of the country. We woke up at 7:30 a.m. to monkeys chattering outside and the sun already high in the sky. Our plan was to drive to Nauyaca Falls about 15 minutes away from Dominicalito where we are staying and, per TripAdvisor review recommendations, pay for a truck to drive us the 4 km and back to the falls. It was thought the truck left on the hour, so I hoped to be there by 8, but we got caught in the beauty of the rental house property in the morning light and rolled in closer to 9 instead. And... discovered that the truck wasn't running. You could walk though- 4 km each way, very steep inclines, hot and humid jungle conditions, with TripAdvisor telling us it was a terrible idea. We looked at the kids, looked at each other, and decided we've been training them their whole lives for just this moment. A beautiful destination requiring a tough hike to get there -- let's do this. The woman at the desk was skeptical, but we paid our $8/person entry fee and set out. I had a small camelpak backpack we'd decided at the last minute to bring, James had the larger backpack with two water bottles, snacks we'd brought from home (granola bars, peanut butter crackers), microfiber towels that fold up very small (possibly my best purchase for this trip, we've used them daily), and bug spray and sunscreen. Plus our ever-present mini first aid kit. We were all wearing our water-hiking shoes I'd bought on clearance for $6 at Target right before we left (well the girls were Target clearance; Landon's were $9 clearance at Academy; James's were an REI garage sale purchase; and mine had been bought from DSW on super clearance for $15 2 years ago and had been waiting patiently to be used ever since). In the end, this was the perfect packing list. And so we hiked. It wasn't difficult hiking- there was a well-worn path to follow, but the jungle humidity plus the steep inclines and declines definitely made it seem longer than the 4 km. There was a sign every 1 km to give you hope and also make you realize you hadn't gone nearly as far as you thought! But it was beautiful and the kids were troopers and I'm so glad we were forced to save the $140 on the truck ride we didn't need. Halfway there is a stop with water and drinks to purchase and a small sanctuary with a parrot, peacocks, and a bunch of monkeys running around in the trees overhead. Then you go down a narrow path to see the long falls first. By now we were DRIPPING in sweat. Or "SO MUCH SWEATY" as Cora kept telling us. But the falls were spectacular and beautiful and totally worth the sweat dripping down my nose. Then we pressed on to the lower falls. We walked down a narrow set of natural stairs (tree roots), turned the corner, and BAM. Gorgeousness. It's important as you see these pictures that when I showed them to James later that night, the first thing he said was, "aw man, you can't tell how amazing they are at all." And it's true. Pictures do not even come close. This was the most beautiful place I've ever seen in real life. The water was freezing and bright blue. The falls were ROARING. The current was strong. Brave little Cora jumped off the ledge near the falls with James. Then the big kids went with him. but you can barely see him through the spray. We were both yelling to each other from a few feet away and neither of us could hear a word the other said. Much more jumping and swimming later and James towed the big kids over to the other side. Cora took a snack break while I did some swimming. I just couldn't get over how spectacular it all was... how is this real? We did some more hiking and climbing down river a bit before drying off and putting our hiking clothes back over our suits to begin the long hike back. We made it to the end, and headed back towards the house, with plans to get lunch in Dominical and see the beach. We ate at a little cafe just before the beach. The kids had homemade bagels with avocado spread, I had a chicken roll that was a flaky delicious pastry filled with seasoned chicken and potato, and James had about 4 different things, all devoured. They gave us a slice of their famous banana bread to go (amazing) and we headed down towards the water. Landon was VERY excited about all the little tables of souvenirs set up by local craftsman but as we were browsing a local told us someone had spied dolphins off the beach. Everyone (including all the locals selling their wares) ran over to the water and we were treated to the sight of a big pod of dolphins jumping and surfacing along the water. It was magic. We walked back to the tables with the locals (I adore the idea that everyone just stops what they're doing to watch dolphins whenever they pop up during the day), the girls played in the surf a bit more, and then we headed home, stopping in our little market to pick up some more groceries for dinner. We went with pasta and jarred sauce- too tired and too full from lunch to think any harder about it. But with the bright yellow local butter on toast and the unnamed local cheese to put on top, it still had some Costa Rican flavor. The kids swam. I wrote the blog post about our travels. James napped. We ate. And everyone was in bed at 7:30 p.m., wiped out from the day but ready for the next day's canopy zip line tour adventures! But Nauyaca Falls, we'll never forget you.